Spandex & Polyester? Ha… Real bike riders don’t need self-wicking materials or aerodynamic doodads. 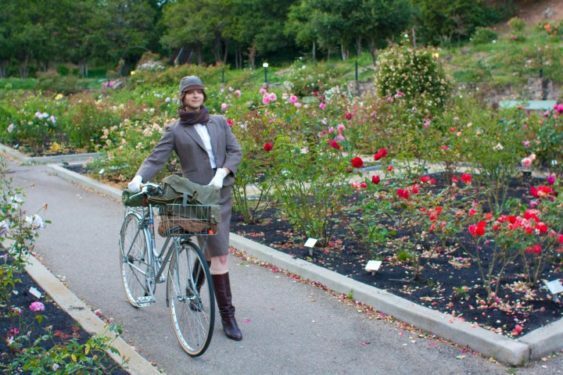 Put on your most dapper tweed, grab a bicycle, and join the merriment at this one-of-a-kind bicycle event as the San Francisco Tweed Ride rolls again with a leisurely ride, picnic and rolling tweed fashion show through the city. The 2018 details and the route are not finalized yet, so please check Facebook for updates. 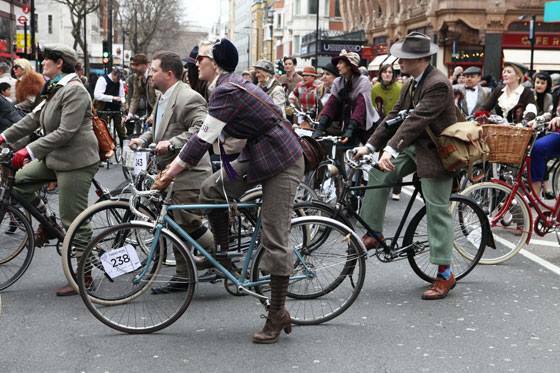 It’s a sartorial celebration – by bike – for riders of different ages, types, and skill levels to enjoy. Don your most dapper woolens. Ride with the most dashing dames and dandies as you tour San Francisco in fine, two-wheeled style. The ride is fun and safe with stops to socialize along the way. Follow a planned route and endeavor to be courteous to the more pedestrian fellows. Of utmost importance is to spread the good cheer of the Tweed Ride. What NOT to wear: molded foam helmets, lycra shorts, ThermaGuard base layers, micro polyester jerseys, clipless pedal shoes, HeatMaxx arm warmers… you get the idea.